The SUPERIOR-series was designed for professional users. It has a classic, timeless design. The riveted handle make it a knife that meets high quality demands. The chef's knife is a classic and the centrepiece in a professional kitchen. It is an essential kitchen tool that allows you to master a diverse array of tasks. 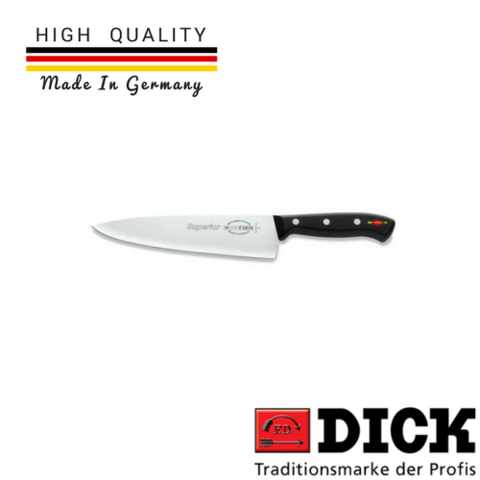 Ideal for cutting herbs and vegetables, slicing and chopping meat and fish. The Chef's knife has a slightly curved cutting edge that is ideal for making a rocking cut i.e one hand grasping the handle and the other stabilising the tip. Herbs, for example, are finely chopped with the upward and downward movements of the handle. Every kitchen should have a chef's knife. Length: 21 cm OR 8.5"